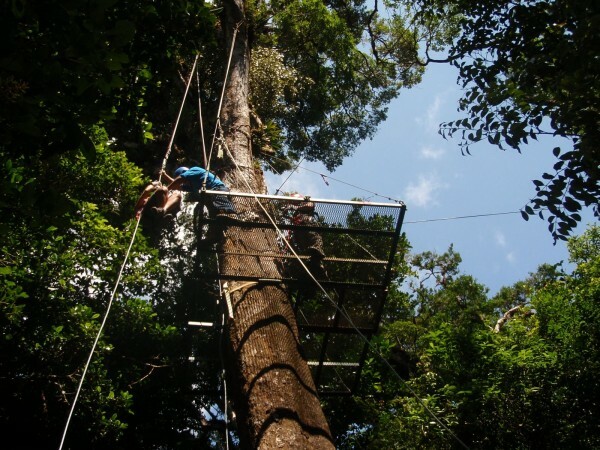 Are you brave enough to swing like Tarzan? I know I’m not the most adventurous or dare-devilish person on earth. Very far from that. Since I was a small, I’ve been a bookworm. I like science, and doing homework was one of my hobbies. Such a nerd! Bungee jumping, sky diving, those are things that scare the hell out of me. I sometimes even chickened out from riding on a roller coaster, like the Millennium Force and Top Thrill Dragster, the scariest ones at Cedar Point in Sandusky, Ohio. Just a month ago, we were in Monteverde, Costa Rica. 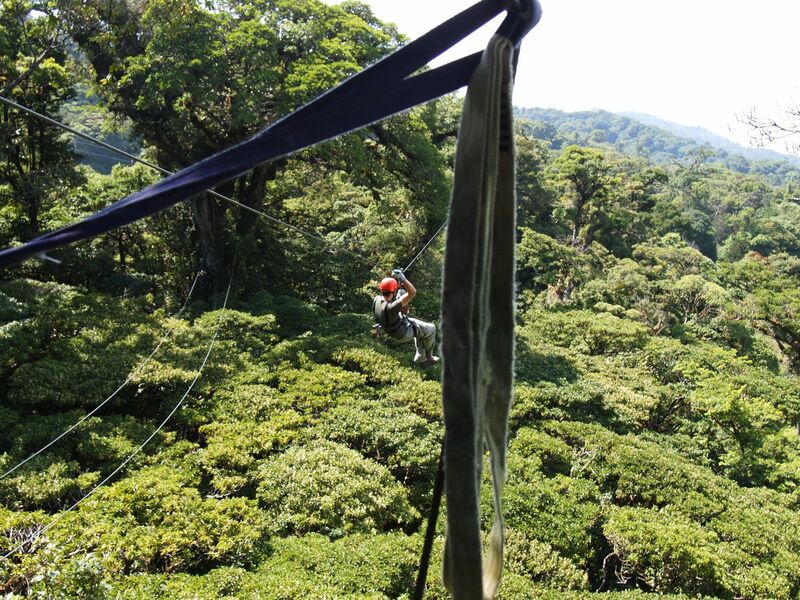 Canopy tours in the cloud forest of Monteverde are a very popular thing to do here, so of course we wanted to check it out. Our friend, Jaime the Breakaway Backpacker, had recommended this tour strongly to us too. His favourite part of the tour was the so called Tarzan swing, a free jump from a high platform with a big pendulum-like swing. It sounded very scary, “an F*ing amazing experience”, he said. It sounded like far scarier than anything I’ve done in my life. So during the whole bus ride from San Jose (the Costa Rican capital) to Monteverde, and the night following, I was dreading this. The following day, we were searching for the best canopy tour in town. Ryan had made friends with the guest house’s owner, Andres, so we trusted his recommendation. He checked that the next tour was about to start, so if we could be ready in 10 minutes, we could do the tour right away. I was gasping and panicking! I know the Tarzan swing is just a small part of the tour, but I felt like I needed some time to breathe, to absorb what was going to happen to me! Whimpering, I asked Andres how scary is the Tarzan swing. I told him I would certainly want to jump, but I wanted the ‘beginner’ one. Something not too high, not too scary. He only said, before he had jumped with this company, but the swing he did was replaced by a new taller one, and he hadn’t tried the new one yet. Well, I didn’t know what to make of that. Ryan didn’t really pay attention to my whining and asked Andres to call the company right away. Then it was all set. I didn’t know what I was signing up for, didn’t know what kind of Tarzan swing they had, didn’t even know the name of the company. Within the next a half an hour, we arrived in the canopy tour location. The briefing was super short, or it was probably because they didn’t really speak English, and we didn’t really speak Spanish. They mentioned there was going to be a canopy walk, a hanging bridge, 12 zip lines, a rappel, a Superman, and a Tarzan. The only description they gave for the Superman and Tarzan was, you will move like Superman, or like Tarzan. Ah! Should’ve guessed that, eh! 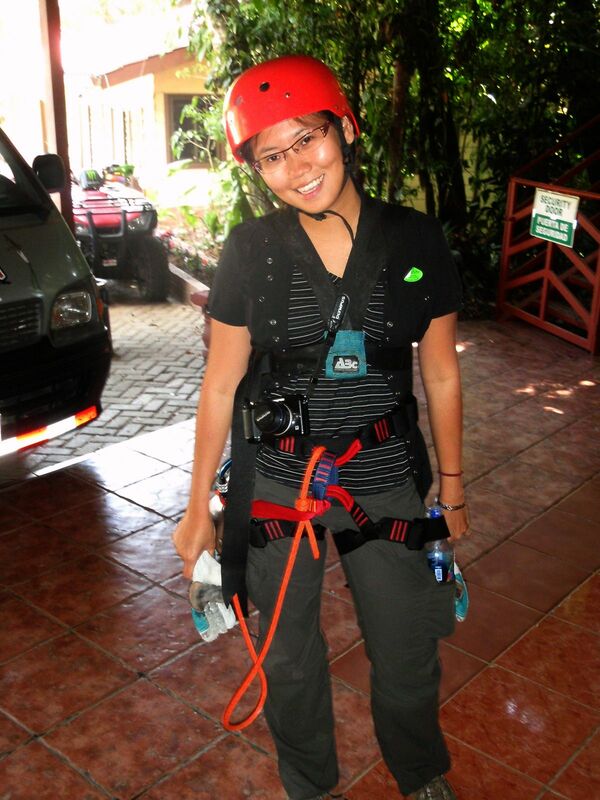 Anyway, this was the first time I was going to be in any kind of zip lining. So I was thrilled. I knew it was going to be easy, since there’s so little we can do while hanging from the rope, moving above the canopy. What I didn’t anticipate before was, it was actually a bit scary to be hanging high up there, moving in fast, dangling from a rope line! The harness, while it’s actually safe, didn’t make me feel safe. I imagined the harness would look like a jacket strap and leg strap. But instead it was just a waist belt, a leg belt for each leg, and a few straps in between. A rope connecting the zip lines and me was attached through a big carabiner in front of my belly. A longer rope, the safety rope, is attached just in case the main rope fails. There was a shoulder strap system too, but it was not going to be used until the Superman zip. So, that’s it. And we are about to hang our life with a few pieces of rope and belts, moving from tree to tree across the valley, 80 meters above the ground, with just that! I'm about to hang my life on a rope with just this harness. Are you kidding? The good news was, there were 12 zip lines, and it starts off pretty mild. At first, we just zip lined between a couple of low trees. Later, we zip lined across the valley. By the time we did the longest one, 600m long and 80m high, we only needed to deal with the thrill of being so up high, but not worrying about falling anymore. This is such a fantastic way to enjoy the beauty of the cloud forest! The trees were way below us, and sometimes we could see our own tiny shadow on the ground. The view, and the feeling, was incredible! Usually hanging bridge makes me a little tense. But this time, I was so focusing to the final Tarzan Swing, so I was not even aware I was on a hanging bridge that was shaking hard each time anybody moves. The 15 meter rappel going down a tree was scarier than I thought. It seems to me when I saw the video of people rappeling, they are able to adjust the speed. Well, it was not so with this one. We were not actually control the speed, and it was near free fall speed. Thank goodness the 15 meters was over only within a few seconds. In the Superman style zip line, the rope ties you on your back, and you are “flying” forward with body facing down, like Superman. I thought the scariness level of this Superman style was going to be like the regular zip line, that I was becoming familiar by then. Not quite! From the point of view of technique, it was actually easier, because you absolutely need to do nothing, while in zip line you need to know how to brake so you won’t hit the tree in front of you. However, in the regular zip line, your hand is holding on to the rope. While in the Superman style, your arms are stretched wide to right and left, as if to keep balance. I never thought of this before, but apparently, at least for me, holding on to something, as useless as it is, brings you a sense of security. When you hands can’t hold on, you feel helpless. Powerless. Something can go wrong, and you are not in control. The worst thing was, not only that you “don’t need” to hold on, but you “must not” hold on! Holding the rope on your back will be totally awkward. 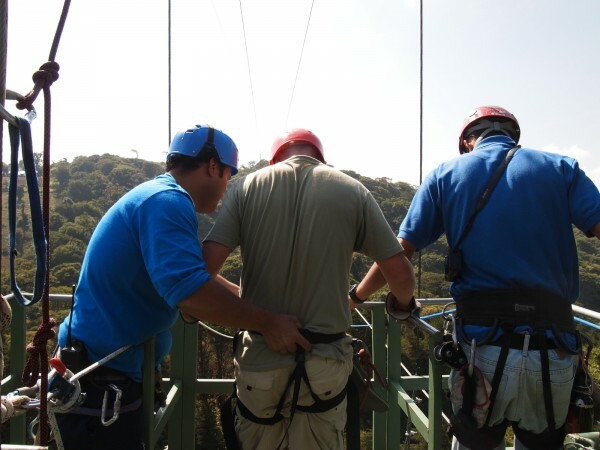 Holding the zip rope will be very dangerous, because you are zipping high speed. Your hands could get caught in the wheels! And even if it doesn’t hurt you, you might accidentally slow down and stop in the middle of the ride, hanging high from the ground. If you are not comfortable with the idea of zip lining Superman style in the beginning, I assure you that you will hate this even more. Superman zip scared the wits out of me! It was dreadful the whole way across. My mouth was open wide, but most of the time, I could only make a faint whimper. I was petrified, I for sure didn’t look like usual image of a heroic Superman. Instead of stretching my legs and arms wide, I had them kinda hanging limply from me. I was going to take photos before, but forget it! I didn’t dare to move my arms. My camera were hanging loosely from me, recording video to random direction it happened to face. Seeing my own tiny shadow on the ground didn’t help. Ugghhh…. I was moving forward high speed, I thought I was about to hit the tree where this zip line ends. And that would have been a frontal coalition. I didn’t trust this tiny helmet. I wonder if Superman faced the same problem too sometimes. Thank goodness the automatic brake really worked! I stopped just a meter away from the tree at the end! And now what? The dreaded and frightening Tarzan swing!!! The ultimate jungle dare today! Remember my plea to Andres to choose a tour with a mild Tarzan swing? 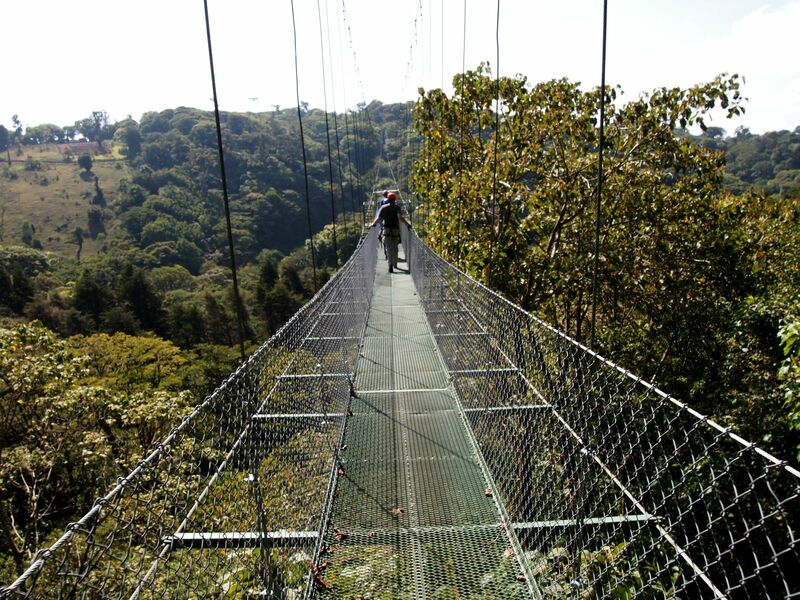 Remember that I didn’t even know which canopy tour we chose? Turns out that… We were with 100% Aventura! Meaning? 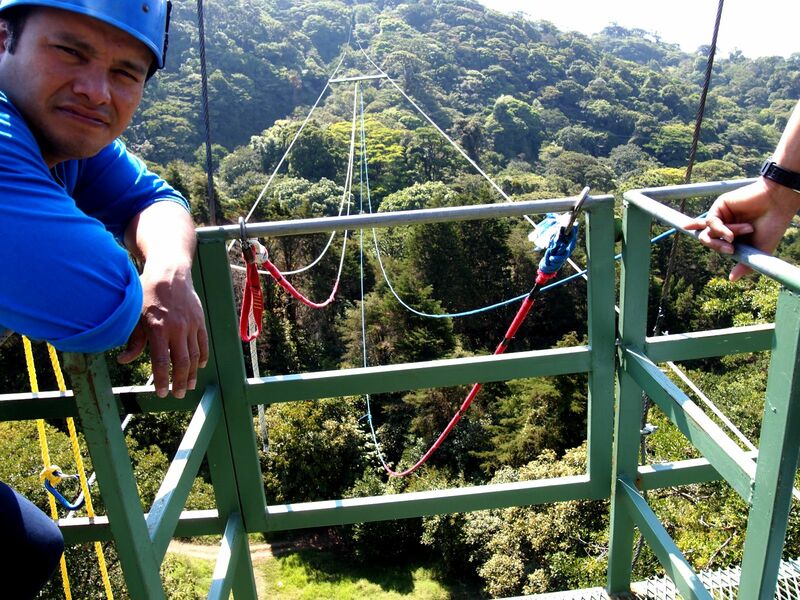 The current highest Tarzan swing in Costa Rica!! The height is 148 feet and the length is 294 feet. It’s like a 13 storey building! What the heck! I watched a guy in front of me about to jump. Look at the tiny skimpy harness that we trusted with our life. Did I do the dreaded Tarzan swing? Super fun!!!!! Way to go, DIna! Thanks It was sooo much fun! THAT LOOKED SOOO FREAKING SCARY & FUUUUNNNN!!! WOULD YOU DO IT AGAIN??? It’s freaking scary indeed!!! But I will do it again, the sensation is superb! I watched some video of the giant tarzan swing in Africa, multiple times bigger above canyon. Frightening. Not sure I will ever be ready for that! OMG. I can do almost everything but the tarzan – freefalling would make me wet myself. Dina, *wow* Kudos for you for doing the Superman AND the Tarzan! I loved that you added the video at the end. Would love to see the Superman vid too. Thanks! I was going to upload my Superman video too, but I didn’t do it because apparently when I was scared, I was making funny noises, like… ummm… private adult interaction, hahaha. So I might upload later on with a song over it. I’ll let you know if I did it. Thanks! I was going to upload my Superman video too, but I didn’t do it because apparently when I was scared, I was making funny noises, like… ummm… private adult interaction, hahaha. So I might upload later on with a song over it. I’ll let you know if I do it. So proud of you that you actually stepped off. I don’t know if I could do it. In the end, its probably the idea of jumping off that’s scarier than actually doing it. Looks like a lot of fun though. Thanks! I jumped with the thinking of it must be scarier to think about it than actually doing it. But free falling felt as bad as I thought, haha. It felt so awful but so awesome in the same time. Sounds like fun! We did a zip line a couple of years ago near Puerto Viejo, but that Tarzan swing looks a little intense! Sounds like great fun (loved your screaming!! )but I agree it’s hard to trust a harness – sometimes the most preventable accidents happen with the simplest of things. Things like slipping out of the harness, knots tied incorrectly, no locking carabiner…I was an assistant rock climbing instructor at one point so safety was drilled into our heads. In a country when you don’t speak the language I think you have to be extra careful. I can’t imagine if something failed. I hope the guys at Monteverde get a good drilling like you too! I read about a woman slipped off the bungee jumping boots in New Zealand, thank goodness it was during the second bounce so she didn’t die out of falling. She was unconscious. This get me terrified to try bungee jumping in the future. Not that I thought I was brave enough to do so, before hearing about this poor woman’s accident. I must say, 12 zip lines sounds like a whole lot of zip lines. Great that you guys were able to experience the cloud forest in Monteverde! We were there back in 2006, it was the first time we did the zip lining, great fun. It was pretty freaky though, especially that really high one, but I don’t deal with heights very well! Cool that you’ve been there too! Must do in Costa Rica, won’t you say? It freaked me out too especially the Superman zip line. Sometimes I forgot that I supposed to enjoy the beauty of the canopy, instead I was just freaking out! Ohhhhh I love Monteverde!! But I’m too chicken to do even the Superman, let alone Tarzan. That’s awesome you did it! I also really liked hiking in the cloud forest, plus how artsy the town is. Thanks! I didn’t picture it before that I would do them either! My friend mentioned she did “monkey”, which is upside down zip line. Fantastic! I really want to do this. Glad you guys got the chance. It looks like a lot of fun. Don’t miss it if you guys go to Costa Rica! Yeah…not sure I could do that. I prefer the tiny tarzan swing that ends up in a hot spring. Mad props for going through with it!!! Whenever you feel like you are ready, you have the chance to always go back there since you are not far away from it Tell me about the tiny Tarzan swing. Actually, ending up in a hot spring sounds really good! Wow! So glad you caught that experience on video because there’s no way I’d be able to step off that platform (afraid of heights lately). Looks like a wild ride =) Good for you for giving it a go! 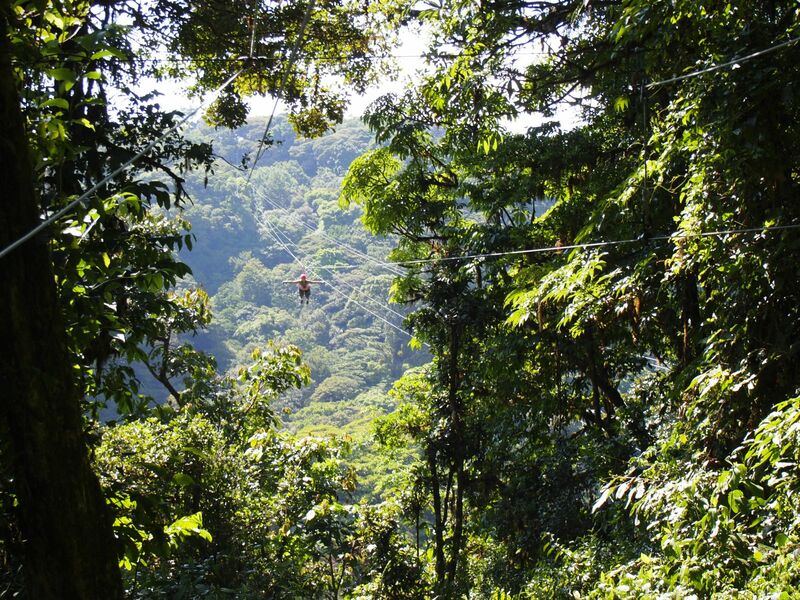 I did a canopy tour in Costa Rica about 4 years ago. So much fun! The video is hiliarious, and I think I would act just the same way as you. Congrats on doing it though! Awesome! Hahaha, it’s authentic, but I wish my plead and scream sounded more dignified. Wow, that looks like a fantastic time. I really need to try those sometime. I missed them when I was in Belize/on the Yucatan. Guess I’ll have to go back and give them a go! Always look like so much fun! It is so much fun, I hope you will see something like this anywhere you are on earth soon! ACK!! 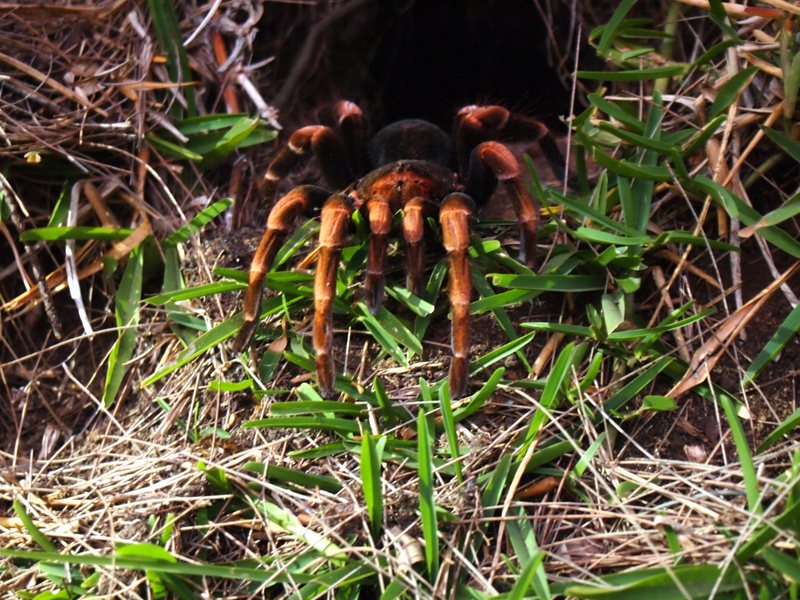 The tarantula alone freaked me out!!! I am sure I would have felt the same way with all of those zip lines … just don’t know if I would have actually done it. I guess I need to get all suited up and give it a go, eh? I would have been terrified! Congratulations on making the big jump, or swing rather! I would have been terrified! Congratulation on making the big jump, or swing rather. OH, my! I wouldn’t have been able to do it either! Bob would have to have pushed me out!!! This looks AWESOME! Every last bit of it! I am with you Dina – not sure I would do it. Yeah, it looks fun and I’ve done some dangerous things. In the end, I would do it but understand your concern about the harness and the steep drop. But at least it’s fashionable right? Just watching the video i felt my heart jump in my chest. You’re so brave ! I would have never been able to do it ! Haha. I remember experiencing many of the same feelings! I did the Tarzan and Superman. It really does make all the difference when you can’t hold on. They had to pull my hands from the railings! And to make matters worse, there was a full on thunder and lightening storm going on when I did it!